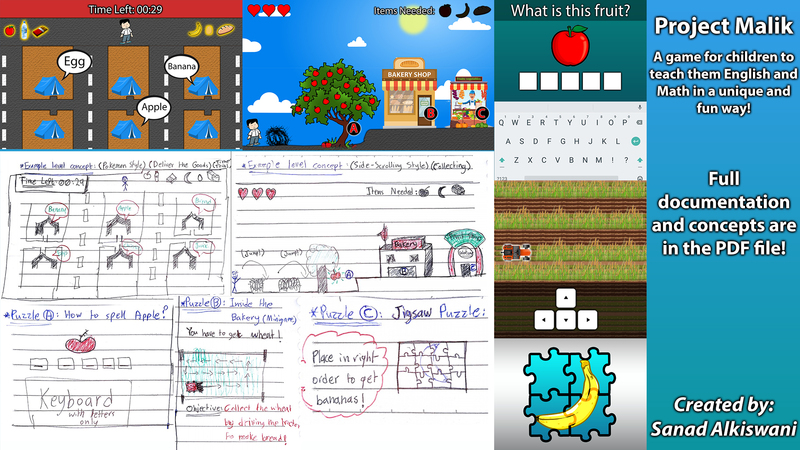 PROJECT MALIK - A game for children to teach them English and Math in a unique and fun way! The game’s story is about Malik who works in a refugee camp. There are very limited food resources in the camps, so it’s up to Malik to help get these resources and provide the refugees with their food needs! The game’s location will be in the city and inside the refugee camp in some of the levels. The concept of the game revolves around collecting the needed resources in a fun way for children. The main gameplay aspect of the game will be centered around different kinds of puzzles ranging from simple word-spelling, to innovative puzzles that will let the children learn the English meanings of words, while having fun playing the game! It’ll also teach the player some basic Math problems in English as well as some interesting information to add into their knowledge!